And of course, “You look good, even with a little of that baby weight still on.” Ah, family functions—such a delicate balance of love and button-pushing. It’s all about finding peace within yourself. The first step toward mindfulness is to check in with yourself and get some perspective. Know whether you have any activated traumas. If you have large, unresolved issues that have you feeling more unsettled than usual, be extra mindful so you’re not in denial about it when you walk into a room with critical family. Identify your personal stressors and if you know your fuse will be shorter, be extra gentle with yourself. Give yourself a wider berth for more sensitivity. One of my mentors is a retired family therapist in Key Largo. She’s deeply spiritual and one of her favorite tools is to excuse yourself to the restroom. And as often as necessary. It’s one of the best ways to alleviate agitation at a family function, especially if you do it with intention. Take deep breaths. Hold your hands under the water for an extra 20 seconds and really notice how the water feels on your hands. (Gentle water on skin is used as a trauma technique because of its grounding sensation.) 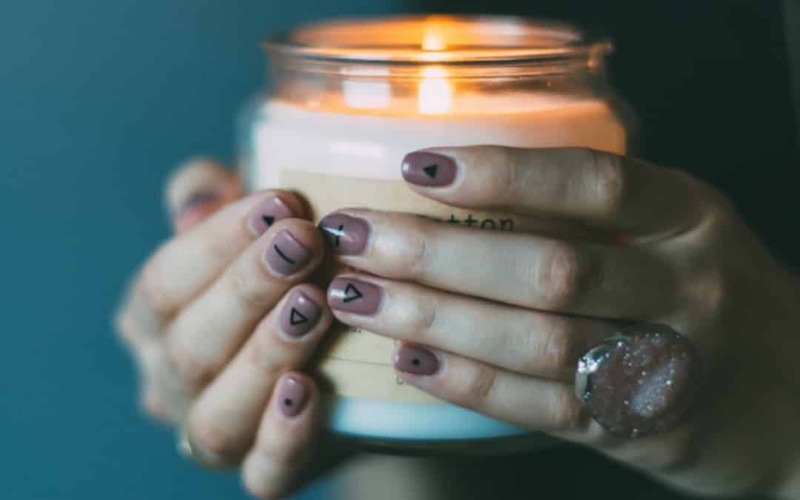 If you’re lucky, perhaps there’s an aromatherapy candle you can inhale to help you switch off the area of your brain that feels stressed out. Practicing gratitude is a cultivated skill. Oftentimes, if you’re out of the habit of taking stock in things you’re grateful for, it may not feel natural. Being thankful for my job or new handbag or my family are really obvious things to feel grateful for, but if you practice for a while, gratitude can be life-changing. You can find a deeper awareness within and it becomes even more gratifying. Now, I can find gratitude in anything—I see beauty and joy even in people’s despair because I know they’re being invited to heal. That comes with time, perspective and being grounded—having an awareness and moving through my day with intention. One of the ways I first started doing that was by keeping a piece of paper taped to my bathroom mirror with a pen hanging from a string. It was a surface I looked at every day, so I had an invitation to practice gratitude with intention by writing down my thoughts or taking notes. The pen and paper were already prepared for me. Once you’re committed to a daily practice like that—maybe you’re keeping a daily journal—the more likely you are to notice things as you move throughout your day. I like to put things in context. If I’m about to complain about something, I try to turn a negative into a positive, to put it into perspective and ask myself if I’m complaining about something I’m taking for granted. If the answer is yes, then I can think about that and perhaps infuse gratitude instead. I recently stayed at a hotel near the ocean. And when I opened the draperies in the morning, I could see the water from a very particular angle. I lived right off of the ocean years ago when I went through a divorce, and then my first breakup after the divorce. These were the hardest times of my life and I would walk along the beach and meditate and find snippets of peace even though I was in a lot of pain. When I realized I was looking at the same piece of water from my hotel all these years later, I was suddenly filled with gratitude. Eight years ago, I was in the depths of despair, and now I have an amazing marriage, a beautiful daughter, and am truly filled with joy. Sometimes gratitude comes later, and that’s OK. It’s important to remember that the things that feel painful today, we’ll feel gratitude for down the road. Otherwise, how would we know how good it feels to be here if we hadn’t been there? So I like to notice how I’ve grown or changed or what I’ve accomplished, to take stock with myself and note that I’m doing well and am proud of myself. That’s my most meaningful piece of advice: Turn gratitude toward self.